John Laster, in a meeting with local Republicans last week, left little doubt about the pro-development views he would bring to the Oconee County Board of Commissioners were he to win the Republican primary on May 22. Laster, a member of the Oconee County Planning Commission and a real estate attorney, is challenging incumbent William “Bubber” Wilkes for Post 3 on the Oconee County Board of Commissioners in the May Republican primary. The only Democrat who qualified for the race withdrew, so the winner of the Republican primary will be unopposed on the ballot on Nov. 6. Laster was joined on the program at the regular March meeting of the Oconee County Republican Party by Buzz Brockway, a candidate for Secretary of State, Jay Florence, a candidate for State Insurance Commissioner, and Joe Hunt, a candidate for Congress from the 10th District. All four candidates gave presentations and asked for support in the party primary. Laster, the last of the four candidates to speak at the March 22 Republic Party meeting, focused on the importance of Oconee County as a “great place to raise a family” in his initial comments. Laster acknowledged the contribution of the county leaders “who brought this county forward.” One of those is incumbent Wilkes, who was in the audience. The meeting took place in an auditorium on the Oconee Piedmont Health Campus at the corner of Virgil Langford Road and Jennings Mill Road, with 43 persons, including the candidates and their aides, in attendance. Laster’s comments on development came in response to a question from Bill Mayberry, who said that the biggest problem the county faces is responding to growth. “Where you see a problem, I see an opportunity,” Laster said. “Those problems that you mention,” he said, “We have a lot of people concerned about the problems and want to circle them up and be worried about the problems. Laster cited his four years on the Planning Commission and his experience as a real estate attorney as indicants of his qualifications. Hunt also criticized Hice for being a member of the Freedom Caucus within the Republican Party. “It is a shame that I have to claim the title of moderate Republican. I’m not a moderate Republican, I’m just a Republican,” Hunt said. Including Oconee County, the 10th Congressional District consists of all or parts of 25 counties stretching from the eastern edges of Atlanta to the Savannah River and from Barrow, Clarke and Oglethorpe counties in the north to Johnson County in the South. Hice, a pastor from Monroe, also will have opposition in the Republican primary from Bradley Griffin, CEO of Optimized, a digital marketing services company. Griffin is from Jasper County. Three Democrats have qualified for the May 22 Democratic primary for the 10th Congressional District: Chalis Montgomery, a teacher from Bethlehem in Barrow County, Richard Dien Winfield, a University of Georgia professor of philosophy from Athens, and Tabitha Johnson-Greene, a registered nurse, who has not given an address. Hunt said the district has two underutilized resources, Central Georgia Technical College in Milledgeville and Athens Technical College, that can be particularly helpful in the economies of small towns. “What I would do is to give folks an opportunity to be partnered with and married to private, business apprenticeships that would give them vocational, experiential learning at the same time as earning credit at a technical school,” he said. “When you give people an opportunity, they are motivated to stay in their home towns, in their communities,” Hunt said. “They’ve got an opportunity to open their own business, become an entrepreneur, create jobs, get themselves out. Candidates were told they were supposed to speak only five minutes in their presentations, and Rep. Buzz Brockway from Lawrenceville stayed close to that limit, though he did use up several minutes at the front trying to pump up the crowd. Brockway said he will focus on two tasks as Secretary of State, elections and professional licensing. Another requirement is “making sure the only people on our voter lists are citizens and eligible to vote,” Brockway said. “What we have seen in the last 50 years in the United States is we’ve gone from an economy that has five percent of the workforce that needs a professional license to almost 30 percent of the workforce now,” Brockway said. “We need to take a hard look and make sure that we’re not over-regulating these professions,” Brockway said. Other Republicans in the May 22 primary are Alpharetta Mayor David Bell Isle, Ken Brown, from Atlanta, state Rep. Brad Raffensperger from Johns Creek, and state Sen. Josh McKoon from Columbus. Democratic candidates for Secretary of State are former Congressman John Barrow from Athens, former state Rep. Dee Dawkins-Haigler from DeKalb County, and former Rockdale Tax Commissioner R.J. Hadley. 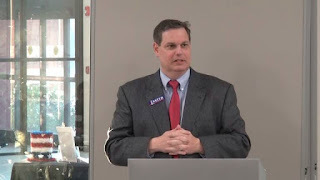 Raffensperger spoke to the Oconee County Republican Party in February, and Barrow spoke to the Oconee County Democratic Party also in February. Hadley also spoke to the local Democratic Party earlier this year, but I was not able to attend that meeting. Florence grew up in Athens and now lives in Norcoss, is an attorney, and worked in the state Insurance Department from 2011 until he resigned three weeks ago to campaign full time. Florence used much of his time to talk about the Affordable Care Act and its implications for Georgia. “We all have witnessed the failed-rollout of Obamacare,” Florence said. Individuals have not been able to keep their plans despite being promised that they could, have not been able to keep their doctors though they would told they would able to do that, and premiums have gone up, not down, he said. Florence spoke favorably of the action taken by President Donald Trump that is “weakening some of the fundamental provisions of Obamacare” and said he expects more health care responsibility is going to be returned to the states in the future. “And so your next insurance commissioner will have a chance to rework a lot of the failed policies of Obamacare if President Trump continues his current course of action,” Florence said. “I would argue that next year you need somebody with experience, that understands the job, and that’s been there trying to address these issues,” Florence said. Florence is facing two other candidates in the Republican primary, Jim Beck, from Carrollton in Carroll County, a public relations practitioner, and Tracy Jordan, from Hoschton in Jackson County, a pharmacist. Democrats Cindy Zeldin, Atlanta, an executive with a non-profit health policy company, and Janice Laws, an insurance agency owner in Atlanta, are competing in that party’s May 22 primary. 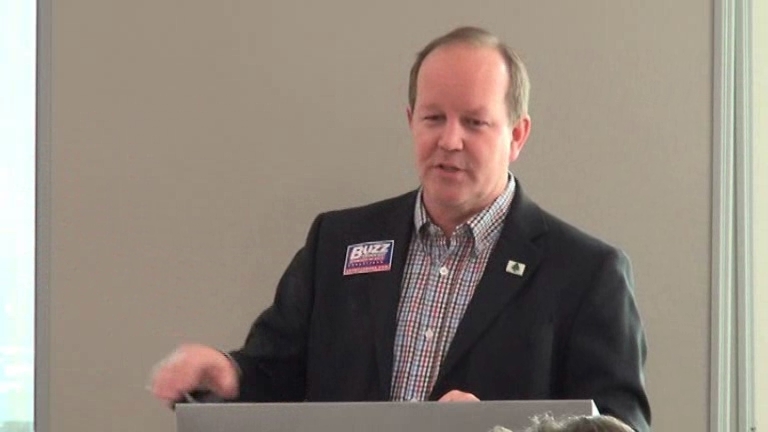 During the business meeting, Tammy Gilland, chair of the Oconee County Republican Party executive committee, reported that Ed Perkins had resigned as 1st Vice Chair for unspecified reasons and Marcus Wiedower had resigned as 2nd Vice Chair because he is a candidate in the Georgia House District 119 Republican primary. Vince Frankson, 1080 Willowynd Way, off Simonton Bridge Road, was elected to replace Wiedower, and Melvin Davis, former Oconee County Board of Commissioners chair, was elected to replace Perkins. Gilland said that the Young Republicans organizations at North Oconee High School and Oconee High School are inactive. Gilland also said that while the Committee was not endorsing Brian Kemp in his run for governor, she was seeking help from the membership with mailing postcards and other campaign work. 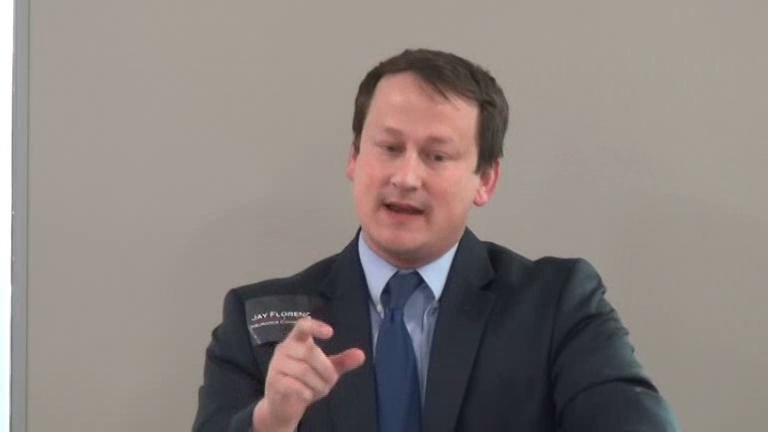 Brockway was the first of the four speakers, and he began his comments at 2:10 in the video. Hunt started his presentation at 27:35. Laster came to the podium at 45:34 in the video. 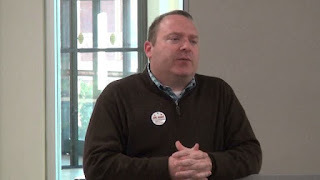 OCO: Oconee County GOP 3 22 18 v3 from Lee Becker on Vimeo. Rep. Brockway said two House seats were “stolen.” How is it stealing to receive more votes than your opponent, especially when the districts have already been gerrrymandered to favor the incumbent party? This language is important from a person who would be asked to safeguard the integrity of our elections. The statements made by Laster were very disconcerting. Then the statement from Laster turns to another twisted approach to governing- “retreat from agriculture and grow neighborhoods”. The increase need for infrastructure, schools, and safety may not have entered his mind if an open season on development is declared. He is a real estate attorney that wants more housing that will help his bottom line and to heck with the future of our community and a sound approach to planning. Laster has stated his bias approach to our county’s planning. Should he be sitting on the Planning Commission? Based on these statements can he make fair and impartial votes on issues? Bias and conflict of interest as a Planning Commissioner- a disaster to the BOC. These individuals, if elected, will make a tremendous impact on our lives. meant to determine his bias. Not a peep about infrastructure, schools, traffic congestion, water and sewer, etc., etc., etc. A real estate attorney and member of the Planning Commission. with a rezone for business, office, industrial, or professional? Until we can get enough citizens to show up at a meeting, nothing is going to change.